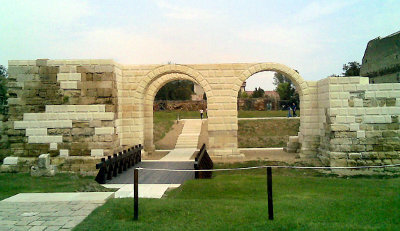 The southern fortress gate (porta principalis dextra) has been excavated and partially reconstructed (image from Wikimedia Commons). More information about the archaeology of Apulum can be found at the Apulum Archaeology Blog. A 3D computer graphic of the fortress has been produced and is described in this PDF. Weather conditions prior to an intended visit can be checked on this webcam. Additional information for inclusion may be sent to info@legionaryfortresses.info (please put fortress site name in the subject line; all other emails may be treated as spam and deleted).